WARNING: If your Big Love Rocket stays up for more than 4 hours, call your doctor. The Big Love Rocket only drops from Heart-Shaped Box, not from the event-boss how it's said in the event article http://www.wowhead.com/news=210480.4/2013-love-is-in-the-air-february-10-february-23-guide#p3372162 " the extremely rare Big Love Rocket, dropped by the event-only boss Apothecary Hummel in Shadowfang Keep". The rarest mount is Reins of the Heavenly Onyx Cloud Serpent. No Big Love Rocket or Vile Fumigator's Mask yet, still trying. Reins of the Heavenly Onyx Cloud Serpent might have a better drop AND each character gets 52 attempts per year, however how long does it take to get a group together to down the world boss? Comparing apples to apples, running for both mounts with the same amount of attempts, you will end up with Reins of the Heavenly Onyx Cloud Serpent first. However it will take more than tenfold the amount of time invested. If you look at the 2 weeks that the Love is in the Air event last, you are far more likely to get a Big Love Rocket than Reins of the Heavenly Onyx Cloud Serpent due to the fact that 14 attempts trumps the 2-3 attempts per character plus time invested. I'm sure the artist knew damn well what the icon he was drawing looked like. The real question is: How did it go unnoticed let alone make it to live servers when items such as Serpent Flesh had its icon changed. Chance to get Big Love Rocket is one in 3333. Chance to get The Horseman's Reins is one in 200.
" You no longer have to be maximum level (110) to defeat the Crowne Company; these bosses now scale like the pre-expansion Demon Invasion bosses. We were able to queue up on level 20+ characters; have fun farming the Big Love Rocket! " You cannot join more than 10 instances in an hour and for some reason this counts when doing this even with your alts. Good thing is that you queue, you get the error that you cannot teleport to dungon but you if your team kills the bosses you still get the Heart-Shaped Box while in town! Edit: maybe Heart-Shaped Carton only are for trial characters? 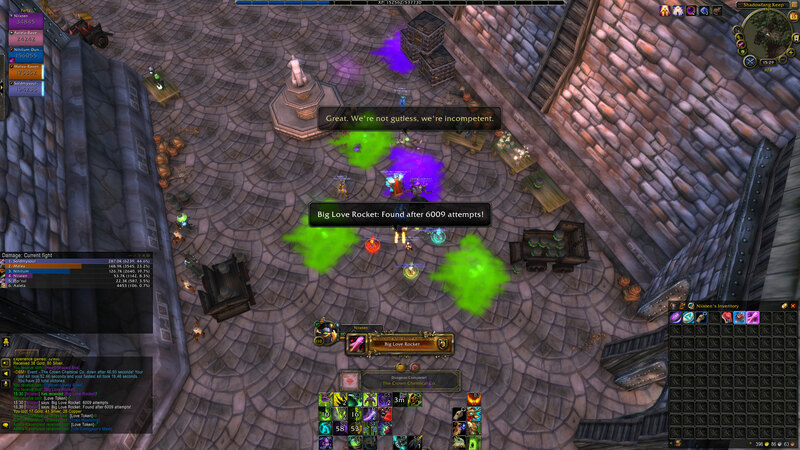 Been running this on 9 chars a day, I've got nothing but tokens and gold, not even a Vile Fumigator's Mask. This is really a testament to how rare this mount is since all the other items have much higher chance to drop and I haven't seen any of them droping. But, one day, I guess, one day. I felt keen and eager with a slight hope this year as 3 of my friends have recieved the Big Love Rocket this year. much like how the The Horseman's Reins had the drop chance changed. however this is not the case. "Apothecary Hummel painted this masterpiece bright pink for an unrequited love."